Valley of the Sun : Team Aggress! VOS was great. Brian was tremendous in his support. In the 60+, Rick finished 5th GC! In the 5’s, Doogie finished 10th overall! I finished 24th and Y in 28th in the 3’s. It was an excellent weekend and a great time dusting off the racing shoes. Vic won the 2’s RR! He smoked the boys in a straight up sprint. Vic also took a huge dig in the 2’s and spent 1 1/2 lap off the front in the crit. It was an all-in move. It didn’t work, but damn it was cool to watch. He finished in 14th. 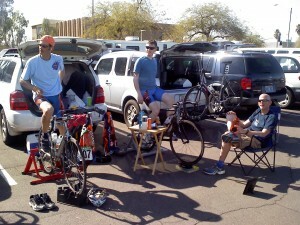 Warming up for the Crit. It turns out nobody brought a camera. The RR was my best event. Shortly after the rollout I moved to the front of the 50/60 combined peloton so I could enjoy a clean path around the first corner and be a little ahead of the inevitable acceleration that I was sure would follow. It did, of course, and I slipped back to 10-12th and I felt pretty comfortable there. About a mile after the turn we passed the Cat 5b group; How could that be?? (50 wheel sucking pussies all afraid to take a pull, that’s how!). The first trip up the hill to the S/F line was uneventful although about 1/3 of the way up Franz Hammer went by me on the shoulder and I tucked in behind him back up to the front. I think he just wanted to see who was on the front because he just sat a little behind and to the side of the leader as the hill got steeper. Eventually I started losing it a bit and slipping back; by the top I was 3/4 of the way to the back of the peloton, but I rested on the downhill back to hwy 187. Lap 2 was mundane until about 2/3 of the way up the hill climb at which point several riders broke off the front to vie for the KOM points and prem. (to be recaptured on the downhill). As the main peloton approached the summit we overtook several riders from the Cat 5a group and there was a crash about 3/4 of the way back in the peloton, just in front of me, involving 5-6 riders and about a dozen of us ended up with a 100 yd gap to the rest of the peloton as a result of slowing to avoid the wrecked riders. We started working together to recapture and actually were able to close the gap a bit by the turn back onto 187. At the turn I took the lead because I knew I could take the turn full speed with pedaling and most of the group stayed with me thru the turn. The main peloton had slowed a lot to go around that corner and we gained on them significantly right there. The last 30 yds was quickly closed and we were back in the peloton; Whew! Halfway up the final hill climb to the S/F line the peloton splintered as the pace increased noticeably and the landscape got a little confusing as we overtook some additional riders from the 5a group, and my fleeting thought of moving to the front of the pack for the final sprint evaporated. I resolved to hang with my splinter group, and was able to do so, across the line. All in all, a good effort, and a great learning experience.